Begin by peeling the citrus fruit using a sharp serrated knife. Take off all the peel and the white pith and then slice the fruit into even slices. Remove any seeds. Lay down a bed of fresh greens on a platter. Scatter the onion slices across the lettuce. 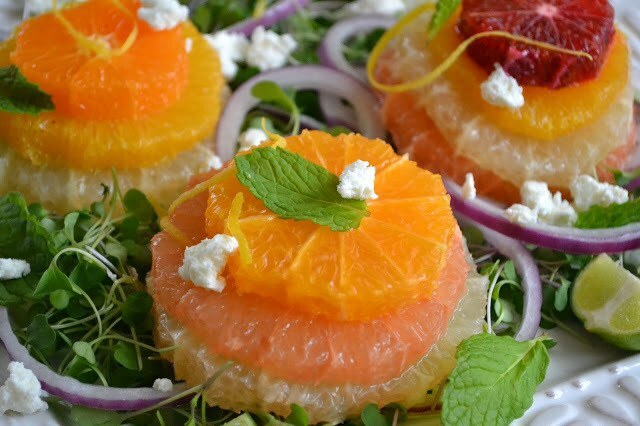 Arrange the citrus in multicolored stacks, making one stack per serving. Scatter the plate with the goat cheese and pistachio nuts. Arrange mint leaves around the plate, and then, just before serving, drizzle the salad with the olive oil and lime juice. Season lightly with salt and pepper.